Flatten Your Feet – We often see beginners trying to stand with their weight on their toes; this is only going to result in a splash! So to avoid getting wet, flatten your feet out when standing up. Lift your vision – Keep your eyes up! Looking forward and outwards will assist your balance and direction. As soon as you look down your peripheral vision is lost and you lose touch with the bigger picture. Soften your knees – Relax your knees and don’t let them lock out or they won’t be able to absorb any sudden movements in the water and you will wipe out! 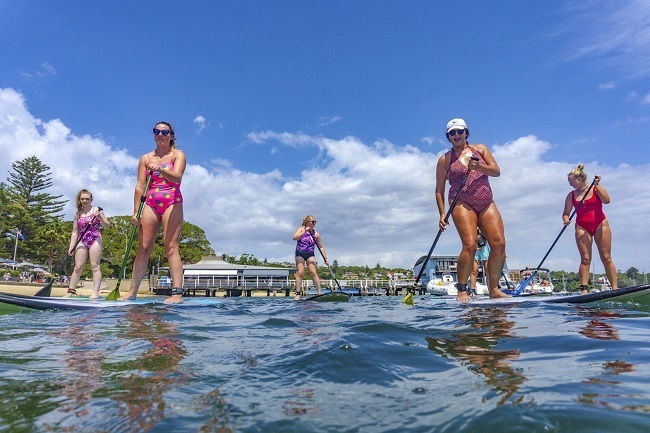 Want to learn how to paddle like a pro and get the most out of your SUP excursions? Book in a SUP lesson with us here. We cater for all abilities – Total beginners to advanced paddlers who are looking to enhance their performance… We have sessions for everyone and all are taught by our expert and highly qualified SUP instructors – learn a new sport, have fun and experience Sydney Harbour in the most spectacular way and meet some cool SUP minded people as well!